Today, 15 December 2013, is a sad day. Not because it's my birthday but because today was the last joint karate practice in the Nagamine Honbu Dojo in Okinawa. Matsubayashi-Ryu has fought for its existence since the death of Osensei in November 1997. So the Honbu Dojo has survived a mere 16 years after his death. After the death of Osensei the focus of the WMKA, perhaps motivated by poorly informed advisers, shifted from martial arts to money (as has occurred with many schools and styles over the years). This was quickly followed by an exodus/expulsion of many talented senior yudansha, renshis, and dojos who remained loyal to Matsubayashi-Ryu and the vision of Osensei preferring to forego the temptation of milking the Matsubayashi-Ryu cash cow. The loss of these superb, senior practitioners and their dojos had a vampiric effect and drained the very life blood from Matsubayashi-ryu. Taira Yoshitaka Hanshi, and his senior staff have a tremendous challenge in (hopefully) extending an olive branch to the many practitioners disenchanted with the old WMKA and then pursuing reunification of the Mataubayashi-Ryu community. 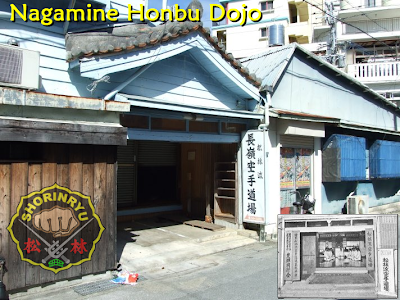 A difficult task but one wherein the Nagamine Honbu Dojo remains a symbolic touchstone. It is unrealistic to expect Osensei's grandson, Nagamine Bunshiro Sensei, as a Ni-Dan to suddenly take over a world renowned dojo and deal with the constant visitation of international senior yudansha and their students many, if not most, out rank him by several dans. Likewise there is only so much President Yoshitaka Taira of the WMKA can do on his own and in a vacuum. They need our support and they need to know how important the Nagamine Honbu Dojo is to us all. Once the Nagamine Honbu Dojo closes its doors it may well be the first domino in a long chain of dominoes falling which threatens to leave Matsubayashi-Ryu unrecognizable to future generations. We don't want to wind up like Tae-Kwon-Do do we?